“Shall I see the Queen?” asked Samantha. “Shall I see the Queen’s husband?” said Charles, not to be outdone. “For goodness sake, stop hopping about or you’ll see nothing”, said Nanny. “Shall I see the Queen?” Samantha repeated. “Shall I see the Queen’s husband?” They went on and on. “I heard Papa say that the Exhibition meant peace on earth and goodwill to men”, piped in Charles. “That’s as may be but there’ll be no goodwill towards me, or you, if your Papa is kept waiting in his carriage. At last everyone was ready and they set off, Papa busily telling them that it was the Queen’s husband, Prince Albert’s idea to invite all the nations of the earth to London, and how this Great Exhibition would put an end to wars and conflict between countries through trade, and how Britain would spread peace throughout the world. But the twins paid more attention to the great crowds that lined the roads cheering. Over the top of thousands of people you could just see the Crystal Palace rising up, which after early showers reflected the May sun off the still-wet glass surfaces and made them sparkle. It all looked unusually light and airy compared to the buildings they passed on their way, almost like it was floating over that part of South London. Once they got closer the children could see what looked like a great glass and iron, tiered wedding cake standing in a large green field. Inside the building there were banks and beds of flowers in a rainbow of the loveliest colours, and there were tiers and banks of people whose clothes were of lovely colours too, so that everywhere was colour, on the ground and in delicate galleries. And there were palm trees, and an organ sending a wandering thread of music through everything, and in the centre there was a platform carpeted in red with a huge sapphire blue canopy above what Papa said was the dais. Great elm trees grew behind it, indoors, and in front of it stood an intricate eight foot tall crystal fountain. Twittering sparrows darted about the elms, Charles lifted his head and watched the fluffy white clouds drifting slowly over a blue, blue sky – they were moving and changing shape, and creating the impression that it was the Crystal Palace that was moving and the clouds that were staying still. Looking up for a long time he was enjoying the sensation that the clouds were swirling around inside the vast curved dome that covered the palace. “Don’t keep craning your neck up Charles. Don’t slouch Samantha. And do not chatter.” Words which soon broke the spell and brought them down out of their own land of day-dreams. Suddenly trumpets sounded, everyone stood up and the organ started to play ‘God Save the Queen’, and a choir sang the words. It sounded small and lost because the palace was so big, but as soon as it was over there was noise enough because everybody began to cheer and to wave handkerchiefs and papers. Then, at last, they could see Queen Victoria. She was dressed in pink and silver and she was walking with her husband, Prince Albert. She held a little boy by the hand – a little boy dressed like a Scottish Highlander – and the Prince held a little girl’s hand. They all went up onto the platform which Papa called the dais, and there they stood for a while, all four of them, with the people cheering enthusiastically and the fountain leaping in front of them, and the elm trees behind them where the sparrows were hiding. Prince Albert made a speech and then presented a copy of the illustrated catalogue of items in the exhibition to his wife. The Queen, Prince Albert and their group then went round the whole building looking at the huge variety of exhibits before returning to the dais and officially announcing the exhibition open to the public. Then it was time to go home. As they left they could see vast numbers of people still queuing outside the building – they were told that these people would have to wait four hours before getting inside. Samantha and Charles now felt very tired and they were only half aware of their father talking as they dozed in the carriage on the way back home. “But there were no black men, no brown men, no yellow men, no red men”, whined Charles. His conclusion upset the children who believed all the words that had been spoken about peace and goodwill. They started to cry but the effort was too great and they soon fell asleep. A strange disappointment filled them as they lay in their beds that night. Later Charles would wake up from a troubled sleep in panic; he had dreamed that he could see again that great glass and metal confection melting like ice cream, whilst firemen rushed around with hoses. He awoke Samantha, for whom else would he turn to in the dark of the night? They huddled together in her bed trying to dispel their fears. As they lay there they weren’t to know that within two years Britain would be at war with Russia in the Crimea. In six years there would be a civilian rebellion in India which had to be quashed, and in nine years Britain’s industry and innovation had turned to the building of iron warships. In just fifty years a bitter struggle with the Dutch in Africa would start the Boer war and a conflict in that continent that would run and run. 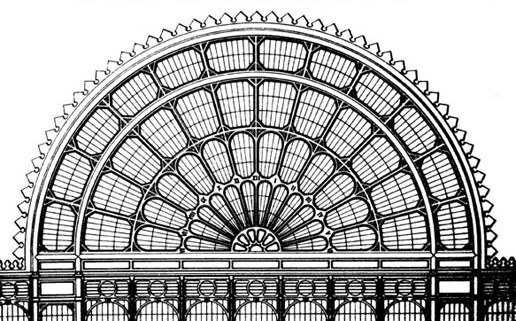 They were not to know either that eventually their beautiful Crystal Palace would be destroyed by fire. One bright spring afternoon as the twins, Sam and Charlie, settled down in front of the telly to watch something that was making their father very excited. It was a documentary programme – something they would usually avoid like the plague. 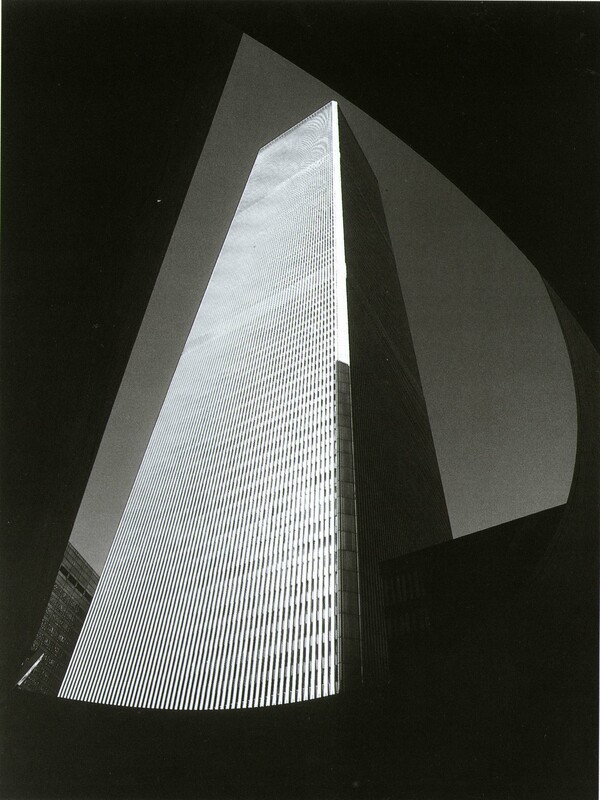 But this was a documentary devoted to a new building in New York City in the United States of America. The commentator was rambling on about the World Trade Centre bringing together businesses and government agencies involved in foreign trade. That it was a ‘one-stop trade information hub’ where ‘an international business person would be offered the full range of services such as market research, trade shows, exhibition space, business services, trade education, group trade missions’…………….. Blah. Blah. Blah, thought the twins. The commentator went on eagerly quoting figures. Charles was bored and took no notice but he liked the pictures of spandrel plates welded to the columns in the fabrication shop; he was fascinated by immigrant navvies digging out the Tower’s supports with shovels and hands deep down in New York mud; he was spell-bound by other workmen balancing high up in the air like acrobats amid steel-plate girders. Samantha was impressed by the size of the thing, one hundred and ten stories, one thousand, three hundred and fifty three feel tall, occupied by fifty thousand people. Even more interesting to both of them was that these buildings would be called the ‘Twin Towers’, surely that meant that it all had something to do with them? 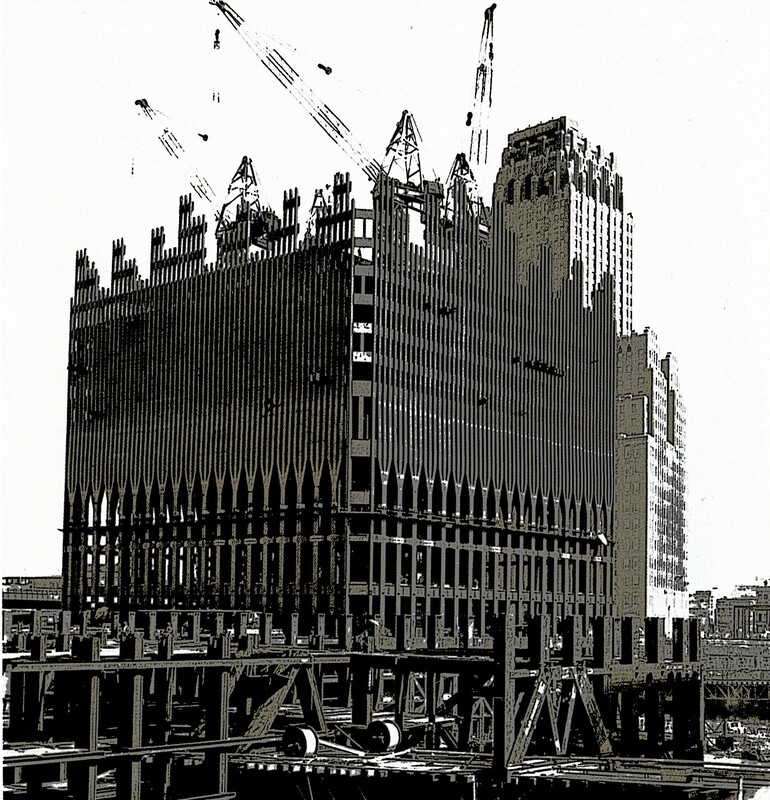 These twin towers were part of a complex of seven building in Lower Manhattan, the interviewer explained, and had been designed by the architect Minoru Yamasaki. “You must be very proud of your design, Mr. Yamasaki?” he asked. “In what way would you hope that this building will be regarded in the future?” asked the interviewer. “It is my sincere wish that in some way this building will point to all the best aspirations of man to live in peace together.” Minoru Yamasaki answered. Over the top of thousands of people you could see the first of the two towers rising up, which, after early morning showers, reflected the Spring sunshine off the still-wet glass surfaces, making them sparkle. The columns, finished with a silver-coloured aluminium alloy made the towers appear from afar to have no windows at all. It was a structure that filled your vision then got smaller as you looked upwards; it was unusually light and airy and it seemed to be enveloped by and absorbed into the fluffy white clouds which drifted slowly by in the blue, blue sky. The camera zoomed in to show tiers and banks of people; firemen with their oddly shaped helmets and dark clothing contrasted with the soldiers and sailors who stood erect in their blue, black, khaki and white uniforms; and generals with their medals glinting in the sun and ladies in their fine clothes. 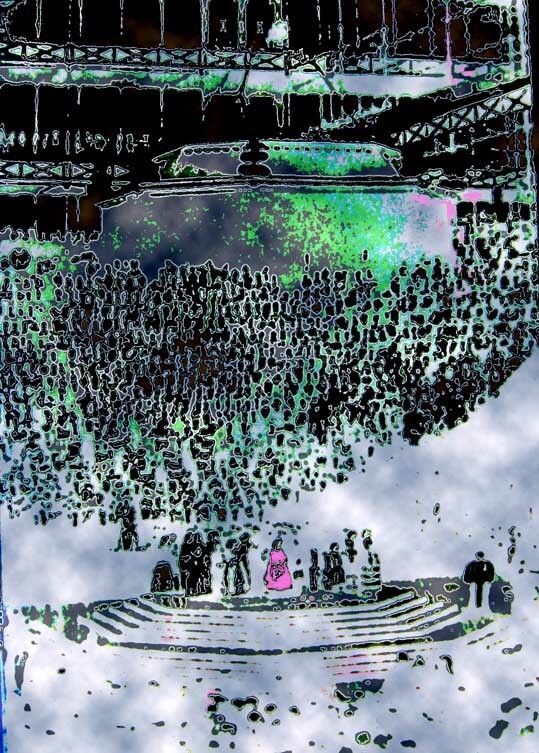 So that everywhere was colour, on the ground and in the banked tiers of the audience; and there was a brass band sending a thread of music through the whole congregation. In the centre of all this there was a platform carpeted in red, that the excited commentator said was called a dais. Suddenly trumpets sounded, everyone stood up and the band started to play stirring music and then a choir sang an anthem called the Star Spangled Banner. As it played all the navvies and firemen removed their hard hats, engineers, designers, architects and invited dignitaries put their hands on their hearts and joined in. All was quiet for a short moment, then there was noise enough as everybody began to cheer and to wave handkerchiefs and papers. A great cheer went round the enclosed space and a dark-haired man, who Samantha thought looked a bit like the proboscis monkeys they had seen in the Popeye cartoons, and his mousy wife went up onto the platform which was called the dais, and President Nixon – for that is who it was – stood as the people cheered like mad and waved their handkerchiefs and little flags that had stars and stripes on them. Suddenly it grew silent and he started to speak into a bank of microphones. “On this day the fourth of April nineteen seventy three, we are joined together to celebrate the New York Port Authority whose vision it was to erect this building. Everyone was clapping, smiling and whooping while thousands and thousands of small pieces of paper – which the commentator called ‘ticker tape’, filled the air. It was a very pretty sight. The brass band started to play a march and everyone watched as the monkey and his mouse got into their limousine and left that place. Oh what a strange sense of foreboding filled the children as they went upstairs to bed that night. Later Sam would wake up from a troubled sleep in a panic. She had dreamt that she could see that great, sharp-edged glass and steel edifice blurring and melting like an ice cream as people ran away from it in terror. Her moaning awoke Charlie and they huddled together in bed trying to dispel their fears. Hadn’t this all happened before? Didn’t it all end badly?